Love can make you do some crazy things. 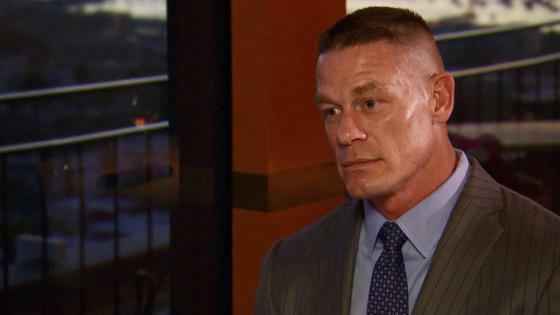 And for John Cena, there's nothing he won't do to keep Nikki Bella in his life. On this week's all-new Total Bellas, the former couple reunited for a romantic candlelit dinner where John made a shocking promise to Nikki. "I wanna marry you and relationship and marriage especially is about sacrifice, and I will make that sacrifice for you. I will give you a child," John promised. "But you have the..." Nikki said, alluding to something preventing John from becoming a father. "I know. I physically can't have kids. So, I'm also telling you that I'm willing to have surgery and then still go through with being a dad," John insisted. Nikki was so floored by John's renewed commitment to her and their relationship that she leaped across the table and into his arms. "I think I'm gonna leave here as a fiancée. I think, yeah. I am still the soon-to-be Mrs. Cena," Nikki confessed to the camera. John Cena to Nikki Bella: "I Will Give You a Child"
The news almost sounded too good to be true for the Bella twin. "You're sure though? Are you gonna change your mind?" Nikki pressed. "I'm not gonna change my mind. I would never, ever say something like this," John confirmed. And that was music to Nikki's ears. "Oh John, you're gonna be the most amazing dad in the world," Nikki gushed. "Just tell me you love me and that you'll marry me," John pressed. "I love you and I'll marry you," Nikki agreed. And with that, the couple seemed to be back on and ready to try for baby! Their reconciliation came after John's very public plea to win Nikki back on the Today Show. "It's kinda confusing right now watching John's interview on the Today show because last we talked, that pretty much was it. If I wanna be a mom, there's no John," Nikki confessed to the camera. Despite the confusion, both Nikki and Brie Bella agreed that John's plea left the door open for their relationship. "I just think that in that interview John could've went two different ways. He could've said, you know, 'This was a beautiful relationship. I learned a lot, but we're going our separate ways.' Or he could say what he did say," Brie told her sister. Lucky for Nikki, that open door helped keep that ring on her finger and restored her dreams of having kids with John. With that, Nikki was ready try her hand at motherhood by watching her niece Birdie after Brie and Daniel Bryan left Birdie for the the first time to go pack up their Phoenix home. "Bryan and I have sold our Phoenix home, but it's so hard to pack and have a baby," Brie explained. "So, for the first time ever, Bryan and I are leaving Birdie." "It's really good timing for her too, because she wants to be a mom and that's why she's going through this whole situation with John," Brie added. "Here you go, Nicole! Let's see if you really want it." Nikki Bella Gets a Crash Course on Motherhood! Nikki babysat for a bit, but she ultimately enlisted the help of a nanny so that she could workout and run some errands. "I kinda wanna show my sister that you can still do the things that you love and need to do in life while being a mom and so today, I hired a nanny. It's one of my best friend's cousins. She's experienced with kids," Nikki revealed. And it wasn't long before Brie was convinced that hiring a nanny every once in a while might not be a bad idea. "When I've always thought about a nanny, I've always felt ashamed like, 'I can do this. I can do it on my own.' But we shouldn't feel ashamed," Brie admitted. "And I do wanna workout. I wanna give more concentration to my companies. And I wanna have more energy for Bird." If a nanny doesn't work out, Brie can always give Nikki another practice run at motherhood!